GEZELLIG HARBOURSHUISJE COTTAGE IN HET OUDE VISSENDORP VAN STAITHES, dicht bij het strand. "Glencoe" is een 200 jaar oud voormalig vissershuisje, gelegen aan de haven. Het huisje is onlangs gerenoveerd en nieuw ingericht. Het slaapt vier in twee slaapkamers. Toegang tot de eerste en zolderkamers is via een korte maar vrij steile trap, waarbij de zolderkamer een laag plafond heeft in delen, dus zorg is nodig. Maximaal twee goed opgevoede honden zijn welkom, maar we vragen u hen van de bedden te houden. Wifi en dvd en een kleuren-tv zijn geïnstalleerd. Parkeren beperkt in het oude dorp, hoewel toegang is toegestaan ​​voor laden en lossen. I am sincerely sorry for the problems with cleanliness of the cottage for your recent stay . I have had a conversation with the cleaner about the points you mention and I am satisfied that it will not recur. We have had many reviews which specifically commend the cottage for its cleanliness so I take very seriously your complaint. I can only put it down to an uncharacteristic off-day - perhaps caused by the busyness of the season and her struggling with a 'bug'- , but no excuses, I unconditionally apologise, and thank you for bringing it to my attention. 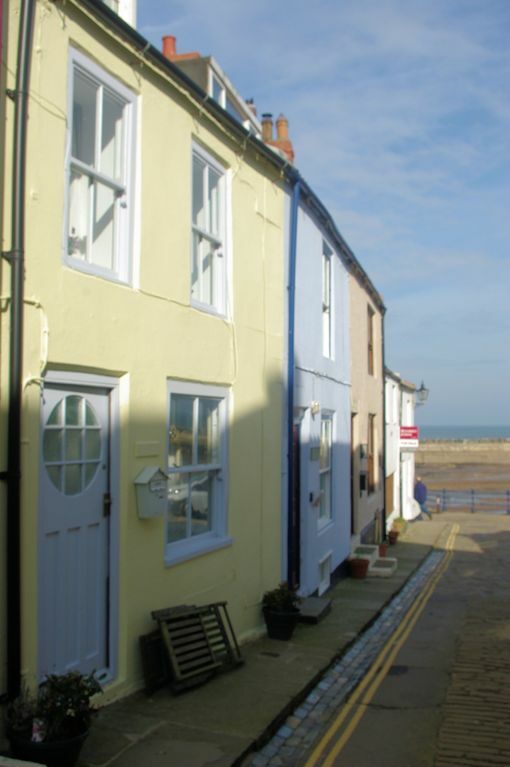 Lovely cosy cottage - very clean and ideally situated. A wonderful cottage in which to spend Christmas and enough room for 3 people and 2 large dogs. Good, clear instructions about arrival and parking and cottage very clean and tidy. It was great to be able to access the cottage from 1pm and unload the car outside the door. Perfect for coffee/drinks/lunch at the wonderful Cod and Lobster.. Owner very helpful as we left an item of property behind and this was posted out to us straight away. Thank you for a great stay - we'll recommend. Thank you so much for your excellent review. I'm so pleased you all enjoyed your stay. Happy New year, and come again! We stayed for a short break lovely location, everything you needed in the cottage, just we got there late, after travelling up after work and there was no wood to make a fire or tea bags or coffee to make a drink. Would recommend and would stay again! I'm so sorry about that. Normally the fire is laid ready for you to light, and we provide a welcome tray with tea bags , coffee, milk and biscuits. I am enquiringly as to what went wrong. However I am pleased that you enjoyed your stay. Do come again. Perfect cosy cottage in a fantastic location! Lovely cosy cottage in a perfect location. Really lovely short break. Cottage was warm, comfortable and clean. Thank you Phillipa, for your positive review. So glad that you enjoyed your break by the sea. Come again! Delightful cottage in a wonderful village. Perfectly positioned cottage literally seconds away from the sea. Everything that you could need. Beautifully clean bedding and towels. Super homely. We were a bit doubtful if we would return because of the hill to the car park then we found the steps. Absolutely lovely place to stay. Contact with owner very pleasant and friendly. We will definitely rebook. Can’t wait. Wonderful meal at the cod and lobster.